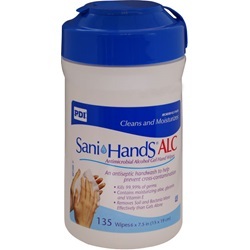 Sanitizing Skin Wipe Sani-Hands ALC measures 6 x 7.5 inches and comes in a wipe canister. Each canister contains 135 unscented wipes. Non-woven cloth saturated with ethyl alcohol gel solution for the antiseptic cleansing of hands. Solution and towel are fragrance-free and dye-free. Proven effective against MRSA. 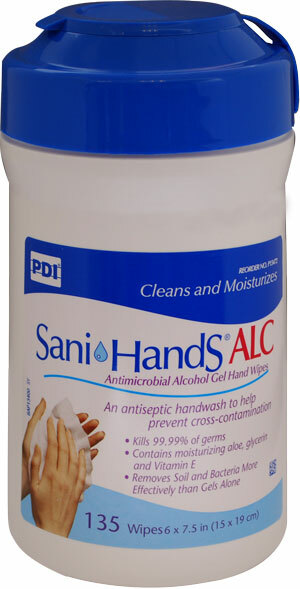 Cleans and sanitizes hands when soap and water are not available. Manufactured by PDI.